A step back in time. Very poor facilities for such a strategic international hub in Africa. Ethiopian Airlines is providing thousands of passengers everyday, with the associated revenue. You would think that the airport authorities would invest in improving the facilities (toilets always have a long queue and extremely abysmal). It really impacts on the Ethiopian Airlines experience in a negative way. "I love Addis Ababa airport"
I love Addis Ababa airport mainly because it's not the bland, boring, characterless modern typical international airport. So much for the subjectivity - now for the objective list of facilities. This review is about the international Terminal 2. There are normal airport rows of seats and many of these are without armrests so you can lie down. The great bonus are the "loungers" - steel-framed loungers comfortably upholstered. You can lie out on these and sleep easily. I was there at peak transit time and there were still a few empty. There were temporary toilets because of renovation work, but these were very clean with an attendant on standby. The other (permanent) toilets at the other end were not quite so clean but given the vast number of people trekking in and out that's not surprising. There were several food / drink facilities. Prices were about the same or slightly cheaper than the UK. Cappuccino plus bottle of water - £3.50. 500ml draught beer - £3.50. 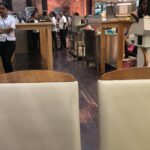 Lots of friendly welcoming staff, and although it was immensely busy with some facilities closed for renovation, I still got seating and still got served. The shops are cool because they sell lots of stuff you don't see at other airports. There's a lot of queuing and waiting around but that's normal. There were enough seats in the departure gate area. Do keep your eye on the screens because gates can change, but staff wander the length of the airport calling flights to make sure everyone's in the right place (even when the gates don't change). There's WiFi in at least 2 of the cafes. "main problem is the ground crew"
After great flights on Ethiopian Airlines I was shocked by the airport in Addis. My main problem with it is the ground crew. Whilst many of them are very nice and do the best they can, some look like they would rather be anywhere but there. They were unresponsive to questions and redirected people to other staff rather than sort it out themselves. The one good thing is that when you are in transit you can go to the interline desk and get a voucher that allows you to get a free dinner and bottle of water. The food is basic but very good, Chicken Wat which was a spicy chicken stew served with rice and mixed veg. Many other international airports should take note of this and offer the same. The biggest bugbear, Bole airport says they have free wifi throughout the airport. This is simply not true at all unless you are in the Cloud Nine Business lounge. This should be changed. The airport is run down. Toilets are not brilliant. Duty free prices are high. The gate was changed twice without informing passengers. Boarding at the gates took a long time. No comfortable seating while waiting for the next flight within a few hours. Our experience transiting at Addis Ababa Airport was poor, and is consistent with my experiencing last year when I arrived and departed ADD. The in-airport shops and concessions are of low quality. The layout of the airport is such that passing occurs when it is time to board, which wouldn't be as bad if each gate had its on security (eg SIN), however gates all share common security lines which on this (as well as my previous visits) were extremely long, so if one doesn't properly anticipate the security delay when heading to their gate, they could miss their flight. We had the access to the Cloud 9/Star Gold preferential security line, and even that took nearly 20 minutes, as other passengers routinely were allowed to cut the line. The airport was extremely crowded. None of the airport arrival and departure status screens were working properly. They all displayed flight information that appeared to be from the previous night's flights. Left T2 for LHR last Monday. Check in efficiency the best I have ever seen there, same with immigration queues with plenty of staff available. Sheba Silver lounge fine, food OK, wifi good. Gate 5 busy but security check in fairly quick, I dont even consider shopping as I know its a rip off, just like Heathrow. "the departure area was awful"
In summary - international arrivals was good, domestic ok, international departures was dreadful. 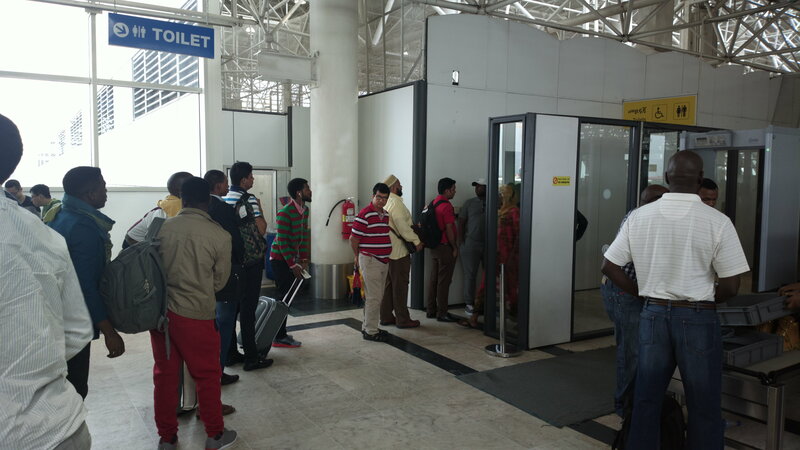 On arrival to Addis Ababa airport international terminal there are very clear directions to immigration, and whilst it does take a reasonably long time queuing to get your visa on arrival this can't really be avoided. The airport is very organised at distributing visas, with a clear and fast new system meaning you don't need to faff around getting a passport photo ready as they have a camera ready to take a picture of you. It is also easy to get your Birr. I personally saw a lot of the domestic terminal, flying Addis to Dire Dawa, Addis to Bahar Dar and Lalibela to Addis via Gondar. I have to say its nothing to get excited about with just 1 slightly dodgy looking restaurant, grotty toilets and a nice seating area. Also be beware that in Ethiopia you have to go through security twice, 1 on entering the airport and 1 before getting on your flights. This is a bit annoying but there's nothing you can do about it. However, departing from Addis Ababa was pretty awful. The checking in was good - machines a little bit dodgy but worked eventually, however the departure area was awful. Considering the country's cost of living and general prices, the airport is ridiculously expensive - £12 for a KitKat. The shops in general were less organised than many of the Ethiopian street/khat markets we went to, and the stuff they were selling was probably of considerably lower quality. Plus the food was awful. Also - do not buy water in the airport. The 2nd security check doesn't allow water through - despite the fact any water that is being taken through that security check having to have been brought in the airport! This side of the airport had considerably ruder staff, although of course this may have something to do with the fact it was past midnight. I am completely perplexed by the duty free situation at this airport; you can buy alcohol at one of the many shops in the transit/departure area, but it seems you are not allowed to carry it on the plane and instead you have to check-in your hand luggage. Liquids are not packed in the standard tamper-proof bags you find at any other airport, meaning that security are justified in refusing to allow it to be carried on. 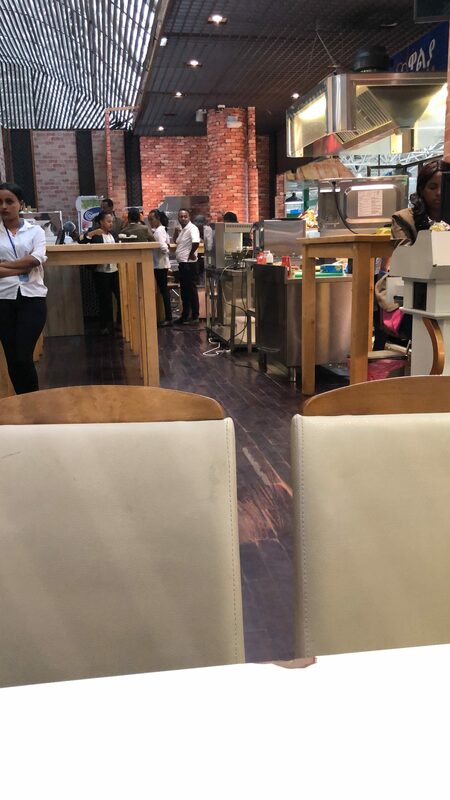 During our second transit through Addis, a verbal fight - which bordered on physical - broke out between two airport staff responsible for scanning Business Class passengers bags. This lasted for nearly 10 minutes, but even when the fight was broken up, the staff were too shocked/distracted to immediately resume work, and so passengers were stuck in the queue for over 15 minutes as the staff were calmed down. Bags were then not properly screened by the distracted staff. Not reassuring. Boarding was a mess, at a gate different from the one advertised, and staff were unhelpful. My experience was bad - the toilets need improving as there were not enough for all customers. Lots of people were sleeping on the floor while waiting in transit. No ATM machines to be seen anywhere. The bank was closed. Places to charge phones or laptop were very few. This airport is disgraceful, especially considering the fact that it is the main hub of Ethiopian Airlines, all their flights into, out of, and within Africa would pass through here. Some poorer African countries actually have better airports. Completely dilapidated, toilets are very few and dirty, lack of places to eat, and those few restaurants all serve bland, overpriced food. Nothing much when it comes to shopping. Checkpoints are chaotic, limited seats for economy class passengers - what else? I spent 6 hours here on arrival and departure (I was on connecting flights to other destinations), and both times I was miserable. Nothing worse than having a long layover in a horrible airport after a long haul flight. Consider the layover times if you are considering flying Ethiopian air to destinations in Africa.